A shift to the wings for Det. First Grade Brian McKenna, leaving center stage to Det. First Grade Cisco Sanchez as Mahoney’s authoritative NYPD series gains a so-so fifth (Black and White, 1999, etc.). The self-styled “best detective in the world,” Cisco, who on occasion is pleased to refer to himself in the heroic third person, clearly doesn’t hesitate to put his best foot forward. Among other useful attributes, he claims unmatched determination—though some of his superiors downgrade that quality to rampant bull-headedness—plus the kind of combustibility that’s calculated and unnerving, sometimes even to his friends. So when 14K, a notorious and far-flung 300-year-old band of Asian racketeers, kills the love of Cisco’s life, it figures to turn into a major bad-guy mistake. Never mind that Johnny Eng, 14K’s head dragon, is too smart to have deliberately awakened the sleeping dragon in Cisco. The point, for Cisco, is that Sue Hsu died violently at the hands of an Eng henchman, and that puts Johnny squarely on the spot. Working closely with his best friend McKenna and a team of dedicated detectives based in Toronto, Singapore, and Hong Kong, Cisco goes after the infamous gangster and his seemingly invincible triad. Methodically, Dragon Johnny is stripped of top-notch aides as Cisco and Co. jail a string of them for lengthy terms. But it’s only when they catch world-class hit-man King Kong Chen and force him to cough up closely held triadic trade secrets that 14K’s glitter pales to a flicker. Finally, Johnny and Cisco confront each other mano a mano, but by then, in a denouement drained of suspense, it’s super cop vs. toothless dragon and strictly no contest. Static characters, pedestrian prose. 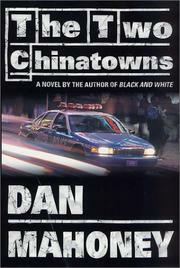 Mahoney, a former NYPD captain, is, as always, at his best with the police procedural stuff, at his weakest with the novelizing.